The reality is, human needs abound in any community. In the Archdiocese of Philadelphia those needs include shelter for those without a home, care for special-needs people, a safe environment for children after school, and many others. Charity — the material outreach of love — can transform those realities and improve the human condition. This vision of “Charity Transforming Reality” is the theme of the 2013 Catholic Charities Appeal, the major annual fund-raising drive supporting 80 programs in the five-county Archdiocese, which launched Feb. 15 at Casa del Carmen Family Service Center in Philadelphia. Archbishop Charles Chaput led the kick-off press conference at the Casa, which is one of seven full-service family support agencies operated by Catholic Social Services (CSS) of the Philadelphia Archdiocese and a beneficiary of the Appeal. “The Catholic Charities Appeal is critical to the good works of the Church in Philadelphia. It allows us to help transform the lives of thousands of men, women, children and families by tirelessly reaching out to those with spiritual, emotional, physical or material needs during a time when they often don’t know where to turn,” the archbishop said. The appeal has a goal of raising $10 million this year. While CSS programs benefit most from the appeal, other programs include education and youth services, support for finiancially struggling parishes and support for the Church’s cultural and family ministries. Casa del Carmen’s programs are typical of the range of services offered by CSS, which receives 48 percent of funding from the Appeal to help serve more than 200,000 people each year regardless of creed. 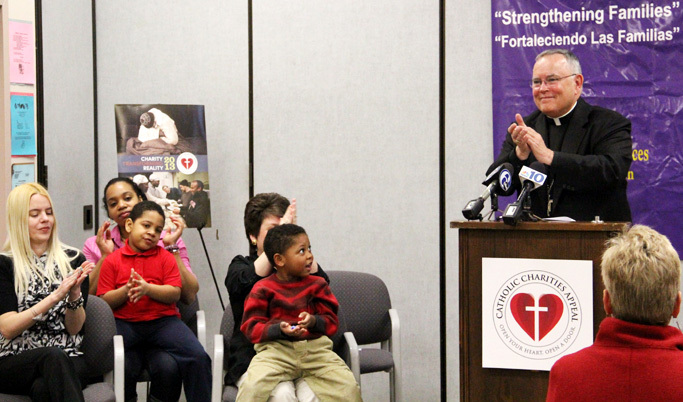 Last Friday at the press conference, Archbishop Chaput introduced several families who utilize the agency’s programs. They included Maureen Zalensky, who with her husband are raising three children adopted through CSS’ Adoption Services. That program and the Child Care/Foster Care program, which provides foster care and kinship placement for children in need of substitute family care, are both run from Casa del Carmen. CSS served more than 100 families in the Archdiocese through these programs last year, Archbishop Chaput said. The facility also hosts two other programs that are vital to 70 working families in the North Philadelphia region each year: the Casa del Carmen Academy for preschool education and care, and the Out of School Time program for school-age children. The latter program is operated in conjunction with the City of Philadelphia at 10 Catholic parishes in the city to provide after-school activities, summer youth development and family support activities in a safe envirnment. The safe environment was crucial to Jennifer Rivas, a working mother of five children, four of whom have used these services. Her youngest will enter the preschool program in September. “The valuable partnership between the city of Philadelphia and Catholic Charities Appeal allows hundreds of thousands to be cared for every year and it provides hope for the most vulnerable among us,” said Thomas Scheaffer, director of policy and evaluation in the Deputy Mayor’s Office for Health and Opportunity and the city’s leader of the Out of School Time system. Now in its 55th year the appeal no longer relies primarily on door-to-door solicitations by organized parishioners, but on a direct mail campaign that has proved very successful. Last year saw a 67 percent increase in gifts received over the previous year, Appeal organizers reported. Of the more than 50,000 donations, about half came from people who never donated or did so after returning to the Appeal from an absence of a year or more. For more information or to make a donation to the Appeal, visit its website or call 215-587-3651.